I recommend this book very highly if you enjoy historical novels that bring history to life. It brought me into the 16th century Florentine life, with all it's warts, humanity, politics and art. A very enjoyable read. It's set during the time of Cosimo de' Medici, the first Duke of Florence, circa 1544. At heart the book is a romance. The dressing around that romance is what one expects from historical novels: the past come to life with all its warts and beauty and humanity. The book features the temperamental artist Bronzino, who was a master of portraiture and allegorical paintings. 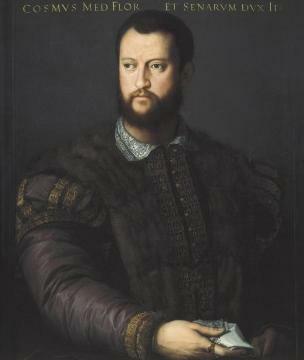 He was also the official portrait painter of the de' Medici. 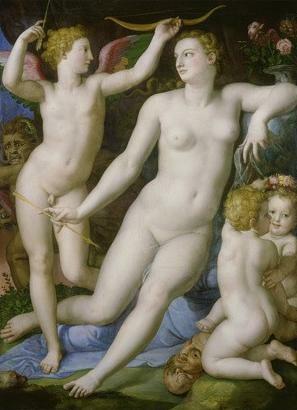 The author traces Bronzino's work on the famous Cupid and the Silent Goddess, making the figures in the painting characters in his novel. Cosimo de' Medici commissioned the painting as a gift for the French monarch Francois I. Bronzino instilled layered meaning into the painting, some meanings we can only guess at. Francois I liked to guess at the meanings, too, or so it is said. He liked his gift very much! I did not want the book to end. The characters were so interesting, I wanted the story to just keep on going. The painter, his abused assistant, who narrates the story and models for the famous painting, Angelina, who is forced to model as Venus for the painting, a mysterious nun and priest, and other artists, as well as Cosimo himself, come alive through the story, just as Bronzino's portrait subjects come alive for us today looking at his paintings. 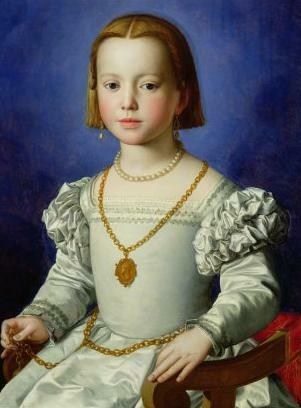 This painting is of Cosimo's beloved first daughter, an illegitimate daughter, who passed away not long after this painting was done, at the age of 5. She wears a medallion that names her famous father. When I was a young man, King Francois of France greatly admired my bare buttocks. I have that information only by hearsay, of course, because my buttocks were in the king's chateau of Chambord while I was here in Italy. None of that would ever have happened if Duke Cosimo de' Medici of Florence had not caught me naked in my master's studio on the hot afternoon of Wednesday the 21st. of May, 1544. 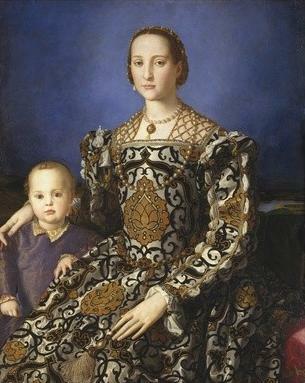 My favorite Bronzino painting is this one of Cosimo de' Medici's wife, Elenora of Toledo and her son, Francesco. I love the detail, especially of the dress, which is the dress they found her buried in when her tomb was excavated not long ago. It is probably her wedding dress. Bronzino painted Elenora throughout her life, documenting the damage the syphilis she got from her randy husband did to her health and beauty. Please visit the author's website from where you can read the first chapter of the book.